Jordan Peele may be a very funny man, but that doesn't mean there isn't a lot on his mind. After establishing his bonafides as one of the brightest young comics in the business through five seasons of the Comedy Central sketch series Key & Peele with partner Keegan-Michael Key, he announced himself as a major filmmaking talent in 2017 with the masterful horror/satire Get Out, which made roughly all of the money and recently won Peele his first Academy Award for Best Original Screenplay — but we all know those things. Peele's road from obscurity to comedy stardom to A-List director and screenwriter has been an interesting one, with briefly diverging paths that may have led him to become an artist completely different from the one we know today. So, let's take a look at some of the lesser-known details in the life of Jordan Peele, a guy who almost certainly has a lot more surprises in store for us. Jordan Peele had his first brief moment in the public eye in 1993, and anyone who noticed may have predicted a future as a political correspondent for him rather than as a comedian and filmmaker. Shortly after Bill Clinton took up residence in the White House, he hosted a nationally televised Q&A during which children from all over the country got to ask him questions in a live studio setting. One of those children was 14-year-old Peele, and as you might have expected, his question was no softball. It was, of course, pointed and detailed: "How can you help the families where there's a mom, and she's taking care of a kid or kids, and the father isn't willing or isn't able to pay child support?" Given only thirty seconds to reply, the President's response was specific and thorough ("If he's not willing, we can have tougher child support enforcement, I feel very strongly about that… if he's not able, and the mother is working and taking care of the kids, I think the tax system should actually give the mother money back if necessary"). Moderator Peter Jennings went out of his way to commend Peele on his question, but if this was the moment that the young boy decided on a future performing in front of people, his initial career choice didn't exactly reflect that. Jordan Peele would go on to attend Sarah Lawrence College, a liberal arts school in New York, with a focus that's more than a little surprising. 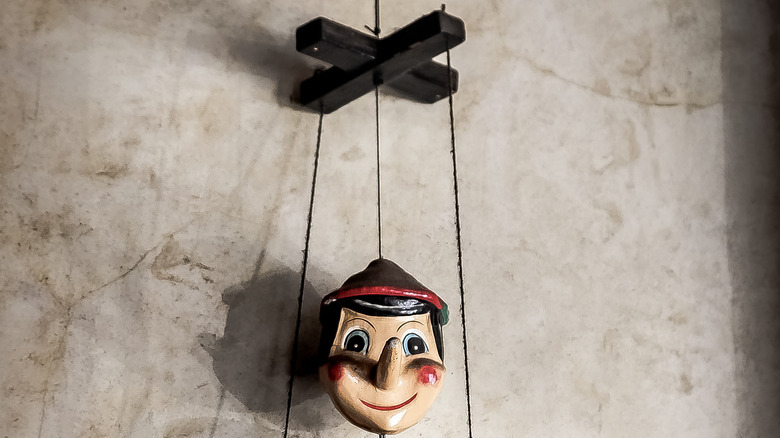 Speaking with Chris Hardwick on his talk show, Peele revealed that he majored in puppetry ("so I was a chick magnet," he deadpanned) and had his sights set on a career as a puppeteer before falling in love with improv. A brief stint in an improv troupe led to him dropping out of college altogether to form a comedy team with then-roommate Rebecca Drysdale, who would go on to become a writer on Key & Peele. 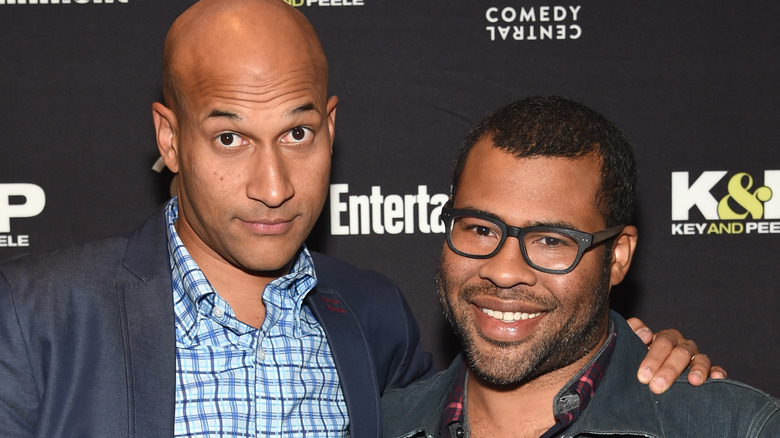 The pair had some immediate local success as Two White Guys (although their publicity materials made clear that they were "a black guy and a white Jewish lesbian"), and before long Peele had landed a spot on the prestigious Amsterdam-based improv crew Boom Chicago. It was while performing with this group at Chicago's famous Second City comedy club that Peele would make the acquaintance of his best friend and comedy soulmate — and of course, he has a funny story about it. Jordan Peele ended up performing consecutive nights at Second City along with another troupe that included Keegan-Michael Key, and the two immediately hit it off. On the first night, Key told Peele a hilarious-yet-horrifying story that had been related to Key by a firefighter friend, about a man who had popped into the fire station squirting blood from his head and enthusiastically claiming to have been shot. The following night, Peele — who was riffing on a "vapid Danish supermodel" routine that had become his bread and butter at Boom Chicago — incorporated elements of Key's story into his standup, which Key somehow failed to notice until it was pointed out to him. Peele thought that Key's obliviousness was the funniest thing that had happened all night, and Key immediately identified Peele as a kindred spirit, telling a fellow audience member "this guy is my brother." Coincidentally, they would end up years later together again, this time in the audition room for an upstart comedy show that was the perfect breeding ground for the pair's comedic sensibilities. Key told Jimmy Kimmel on his talk show that the pair had "fallen in comedy love" at Second City, and had kept in touch before both auditioning for — and landing roles on — MadTV, the Fox network's long-running sketch comedy series. Key related in an interview with Complex that the whole situation "was very serendipitous. I was working on a show and the show got canceled, and Jordan was working on a pilot and the pilot didn't get picked up, so we happened to both be free at the same time. Our managers said, 'What do you guys think about doing [a show] together?' And we jumped at the chance." It was for MadTV that the duo wrote their very first sketch together, and Peele said in the same interview that "the very first time we collaborated on a project you could tell there was something a little bit special happening, something a little bit different." It would take a while longer for that something to come to full fruition, however — and while MadTV's loose format may have helped foster their chemistry, it was the show's unwillingness to budge on contract matters that would keep the two friends on the same path. Key and Peele plied their brand of comedy for five seasons together on MadTV, but the rise of a certain Illinois senator up the ranks of the Democratic Party and all the way into the White House presented Peele with the opportunity of a lifetime. By 2008 he had honed his gift for impressions to a scary degree, and when comedy institution Saturday Night Live found itself in need of a Barack Obama impersonator, Peele felt like the job was his to lose. Speaking with The New Yorker, he called the opportunity a "dream… this is what I set out to do." Indeed, he may very well have been offered the job had he not still been under contract for another year to MadTV. Although Peele was crushed — he felt that he had "strategized everything perfectly" and had a hard time swallowing the fact that a legal snafu was depriving him of his best opportunity yet — he reasoned, "Well, what does this mean? This means there's gotta be something that I can put these skills into; there's gotta be a reason I'm not doing this, ultimately." That reason became clear in 2009, when their MadTV contracts expired and their mutual agent approached Key and Peele about doing a sketch comedy show together. The suggestion would lead to five seasons of comedy gold with Key & Peele, several explosively popular viral videos, and a co-directed feature film (the well-received Keanu) — but Peele never forgot that his childhood dreams lay in slightly darker corners of the entertainment world. Before the release of Get Out, some observers were a bit skeptical as to whether a comedian — even an obviously talented one — could write and direct an effective horror film. 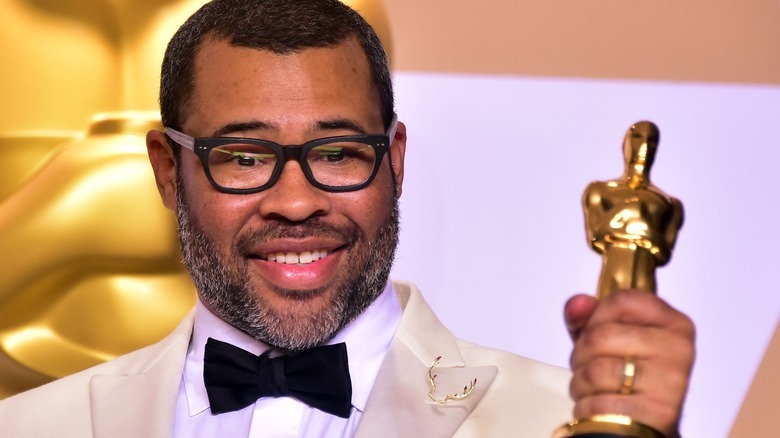 But as Peele revealed in a promotional interview with Forbes leading up to the film's release, it had been his dream since childhood to become a director, and his heart had always been with horror — in part because of his proximity to the shooting location of one of the landmarks of the genre. Asked to name his favorite horror films growing up, Peele was quick to cite Roman Polanski's Rosemary's Baby ("possibly my favorite horror movie"), and noted that he had grown up just a few blocks from the famous apartment building where it had been shot. Aside from other such classics as Halloween, The Shining, and the works of Alfred Hitchcock, Peele also singled out the bizarre 1975 sci-fi/horror mashup The Stepford Wives as an important influence on the tone of his opus. But when it came to solidifying his ideas for the story that would become Get Out, it was events unfolding in the real world — filtered through his own unique worldview — that would provide the most important inspiration. Jordan Peele has always been sensitive to issues involving race relations, and for good reason. He is of mixed-race heritage: his father is black, but he was raised solely by his mother Lucinda WIlliams, who is white. Early in life, he found himself being mocked mercilessly for his speech patterns, as he told NPR: "The world has wanted me to speak differently than I speak. I speak like my mom; I speak like the whitest white dude; I speak like a Def Comedy Jam comedian doing an impression of a white guy … It cannot be a coincidence that I decided to go into a career where my whole purpose is altering the way I speak and experiencing these different characters." Key (who is also biracial) agreed, saying that the multicultural nature of theater "salvaged [his] life in high school," and pointed him towards his career path. 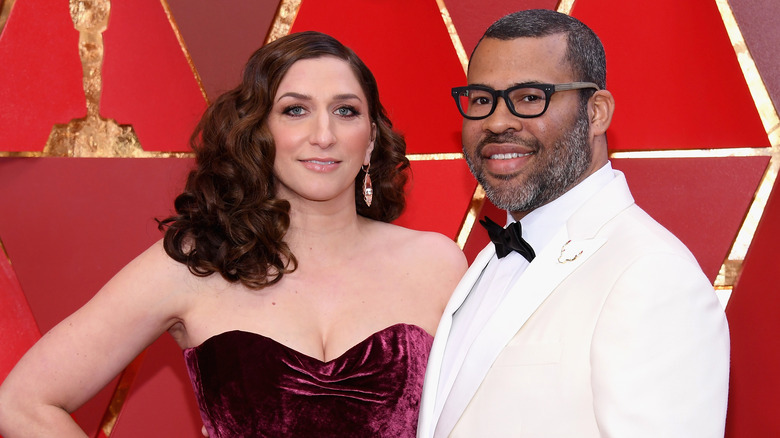 Today, Peele is married to white comedienne Chelsea Peretti (who hilariously responded to Get Out's success by tweeting, "we all cried for weeks, we were so hurt to see our family secrets exposed in this documentary"), and while it's tempting to think that their relationship must have been the impetus for Peele's breakthrough smash, that would be way off the mark. Strangely, his primary inspiration for Get Out was the same event that might have sent him on a totally different career path — the election of Barack Obama. Obama's 2008 election to the highest office in the land was taken by many as a sign that America had finally entered a post-racial phase, a new era in which skin color truly had no bearing on an individual's opportunities or social status. Peele found this notion to be not only simplistic but dangerous, telling a Sundance audience that he felt the US was "living in this post-racial lie," which made him think about how white and black people think about racism differently. Even well-meaning whites, he felt, were oblivious to the "monster of racism" that lurks underneath everyday interactions and conversations — a monster which he felt he could illuminate through the storytelling conventions of his beloved horror genre. 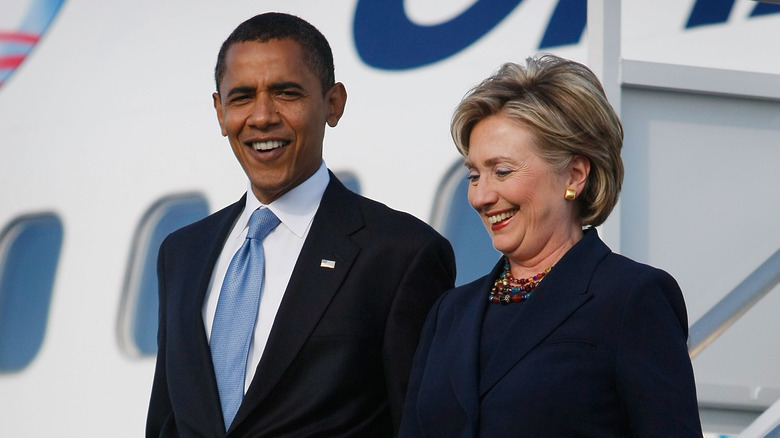 Speaking with The Daily Beast, Peele clarified, "When Hillary and Obama were competing for the Democratic nomination, there were a lot of questions raised about gender civil rights and racial civil rights, and almost a pitting against one another of the two different causes. I began to look at those two issues as being parallel issues, and two of my favorite movies are Rosemary's Baby and The Stepford Wives. The way that those movies deal with gender and are ultimately about men making decisions for women's bodies — and address justified fears from the women's lib movement — was a signal to me that you can also do a movie about race using the same model." He plans to continue dealing in "social thrillers"
Get Out proved to be not only a modern horror masterpiece, but the most profitable film of 2017, raking in $255 million worldwide on a paltry $4.5 million budget. Peele may have been an unknown quantity before its smash success, but if there's one thing Hollywood understands, it's massive profits — meaning that we can expect to see a lot more from horror's newest auteur in the near future. Peele parlayed the success of his debut into a first-look deal with Universal Studios, and the first film to come from that deal — as yet untitled — is scheduled for release on March 15, 2019. 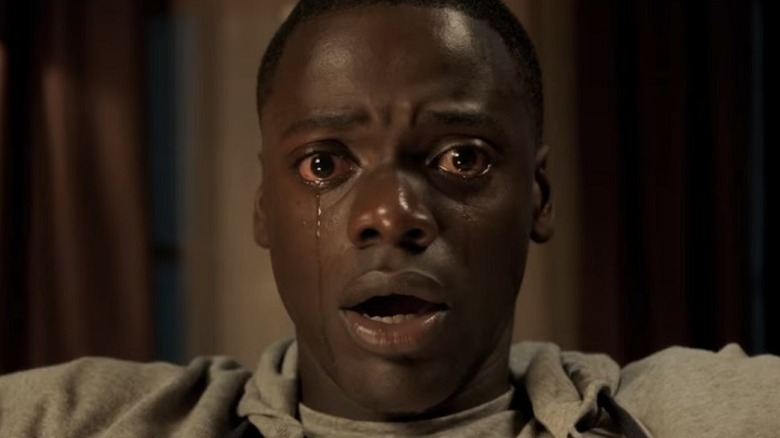 But that's just the tip of the iceberg: even before Get Out's release, Peele told Business Insider, "I have four other social thrillers that I want to unveil in the next decade… The best and scariest monsters in the world are human beings and what we are capable of, especially when we get together. I've been working on these premises… these innately human monsters that are woven into the fabric of how we think and how we interact, and each one of my movies is going to be about a different one of these social demons." Meanwhile, Peele is also signed up for a series at HBO titled Lovecraft Country, bringing a black perspective to the Lovecraftian mythos. Far from being a one-off, it appears that Get Out was just the opening salvo in a series of films that could help to redefine horror — and, in the process, work toward reconciling some of the deepest and oldest wounds in our society. While we're all excited to see what Jordan Peele is cooking up for us from behind the camera, plenty of us sorely miss his affable and hilarious presence in front of it. Unfortunately, he recently made the announcement that he is done with acting for the foreseeable future, and while there were almost certainly many factors to his decision — for one, he thinks that "acting is just nowhere near as fun" as directing — there was one incident that cemented his decision, and true to form, it's a funny story. Speaking at the Directors' Guild of America Awards, Peele volunteered, "The Emoji Movie actually helped me quit acting. I was offered the role of Poop." He paused for comedic timing, then added, "This is true. I would not make this up." It seems that Peele initially rejected the offer before actually mulling it over for about a day. 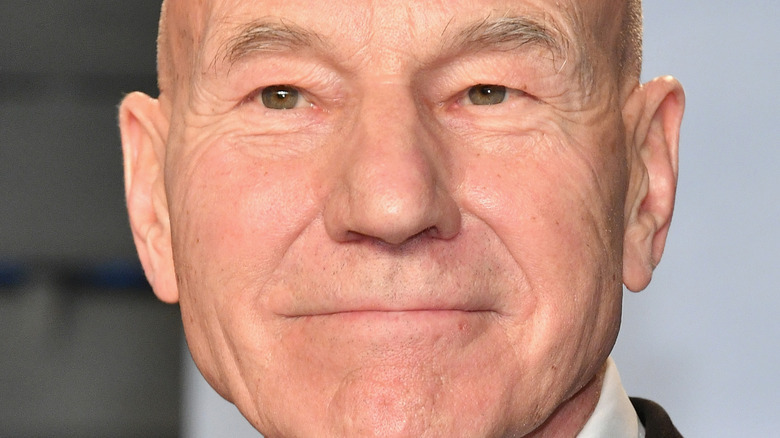 Giving in to curiosity, he called his manager to see what the gig would pay, only to be told that the role had been offered to Sir Patrick Stewart, which was apparently the last straw ("I was like, 'F— this,'" he deadpanned to the crowd). Of course, nobody will begrudge the beloved Stewart for picking up that paycheck, but the world really didn't need any more reasons to hate The Emoji Movie.